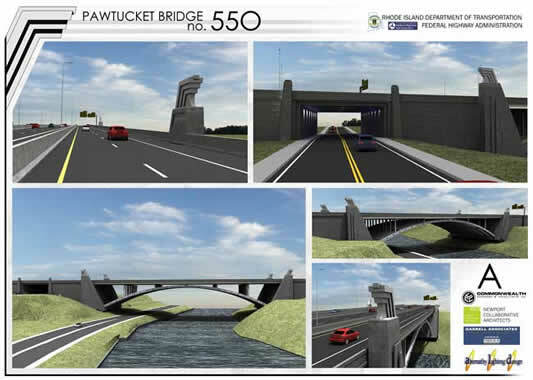 Earlier in the month I posted about the release of designs for the proposed New Pawtucket River Bridge on Route 95. At the time I was only able to track down the teeny tiny little image posted with the PBN article on it. Well, while looking on the RIDOT site for something else, I came across a page with better renderings. There are a few more renderings and some information about the new bridge here. Looking at the first rendering, it appears that there are three roadways on the bridge. Are they planning a reverse-able rush hour configuration like the Expressway in Boston? Wouldn’t that require a lot of work to make the rest of Route 95 reverse-able? Would that even work here, don’t we have a more or less two-way rush hour with traffic coming in and out of the city but also traffic coming through Providence from points north and south? If they hadn’t rendered cars in it, we could have hoped it was a bus rapid transit lane (BRT). Wouldn’t that be a nice (cheaper, more flexible) alternative to the train? I suppose it could be some sort of local access lane. I can’t see the full bridge from above to see what the lanes are doing. Perhaps it is a side lane to collect traffic from George Street and allow traffic to exit at Water/School Streets, rejoining the highway later. Also, looking at the Pleasant Street tunnel, I don’t understand why it can’t be wider. I understand the engineering reasons for not having it open to the river, but does it have to be so narrow. A simple bridge can span a wider gap than that. I also wonder if some kind of groin vault could not be used to provide the strength and engineering capacity needed by that large structure between the river and Pleasant Street, but still allow for more openness under the bridge. It could be a lane for managing traffic to or from a toll-area too. There’s a lot of talk about tolling our highways. My biggest concern is that this bridge is designed with long-term maintenance costs in mind. More than anything, we need to design and build it in a way that doesn’t cost a fortune to maintain. I’m really worried about maintenance because I work right next to the I-Way project and I can see rust spots and water damage on parts of the overpasses that don’t even have traffic on them yet. 4. 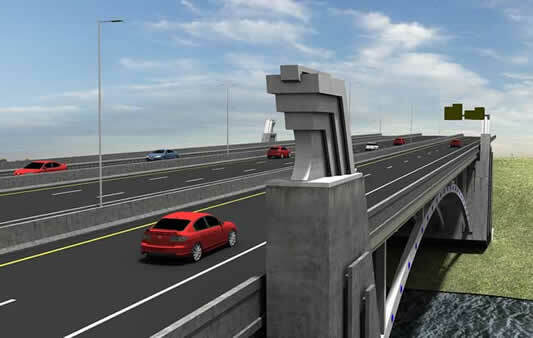 New Bridge Solves Problems – The concept for the new bridge is an improvement. In addition to the three lanes each way, the northbound side will add two lanes, separated from the main traffic, to handle the George St on ramp/School St off ramp. The merge lane will be extended several hundred feet. The construction plan is totally boss: they build the two new service lanes and then replace the existing bridges. The last step is to demolish the existing northbound lanes and then “slide” the service lanes into the space where the demolition just occurred. The “wings” are sort of Berlin 1940s… a little bit of Facist architecture. I’d like to see something more like the Art Deco of the iWay, I think they did a good job with those corner bridge markers. That being said, it is a vast improvement over what it might have been. I’m still disappointed that it doesn’t represent a bridge to the driver using it. The iWay has the graceful arch which says “bridge over water”. This still is just an overpass. You could be going over a roadway (and you’d be half right). It’d be nice if they indicated the Blackstone River – one of the hardest working industrial rivers in the country – a little more while you were on the bridge. Too bad they don’t make bridges out of that see-through metal grating that they used for the Jamestown Bridge. Scary as hell in the winter, but man, what an effect! Certainly makes you notice what you’re traveling over. I saw the corner markers as highly abstract eagles or falcons sitting on a perch, but what do I know? I can certainly see why you view them as Berlin 1940-ish. I actually like them quite a bit. 2 seconds? Slowpoke. The speed limit is 95, after all. The decorative corner markers look like an architectural salute to the Apex building. Cool building but a classic suburbia-to-the-city’s-rescue planning mistake. They are a little more brutalist than deco, and yes, they are supposed to represent eagles per city hall. I think deco takes more artisanship = more money, than a brutalist representation of an eagle. 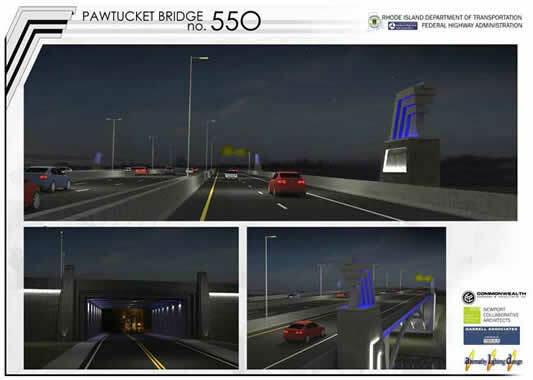 The first image of the slideshow on the RIDOT page shows the eagle that supposedly inspires the design. It maybe should be noted that this is just a rendering, the eagle motif could change once the plans are finalized. Some sort of abstraction of City Hall itself would be interesting. With lit beacons at the top. Does anyone else find it a little creepy (or at least disconcerting) that the renderings make no effort to account for the urban surroundings that surround the bridge? You think they could have gone to the trouble of “Photoshopping” the bridge image over a photo of the actual location in at least one frame. David – if you look at any of the 3-d renderings of the RI DOT projects on their page, none of them include photos of the surrounding areas. Most likely to keep the focus on the bridge and it’s features. It most likely would get lost if you shopped in the backdrop. In that case, I have to ask what is the point of a “signature” bridge if it’s in danger of getting lost in the background of its urban setting? I guess part of what I am saying is that just because this sort of disembodied 3-D rendering suits RIDOT, doesn’t make it OK. It’s just the easiest way to do the rendering, and seems to indicate that the agency doesn’t really give a hoot about whatever clutter (i.e., the City of Pawtucket) happens to be around the bridge. Just because it’s bare concrete doesn’t make it brutalist. It’s Moderne – sort of one step past Art Deco. J is right on with his reference, in that the style was based on the Bauhaus/International style, and mostly used in the 1940s. I doodled in my text book during art history lectures. The Bucket Blog has a video up showing how putting Pleasant Street into a tunnel will be a bad move for Pawtucket pedestrians. According to the ProJo, RIDOT is seeking bids starting July 9th with work to start this fall and be completed no later than June 2013. 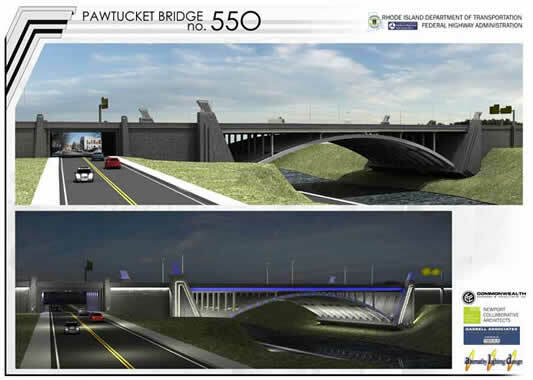 RIDOT announced a groundbreaking ceremony for the new Pawtucket River Bridge will be held Thursday, November 4th at 2pm. RIDOT announces partial closure of Pleasant Street for the construction of the New Pawtucket River Bridge. Pawtucket would use the money to repair city road detours that trucks use and to help businesses that are affected by the detours, according to the proposed bills. City Councilman Albert J. Vitali Jr., who testified before the House panel and was slated to testify before the Senate panel, said in an interview that the state has collected nearly $15 million in fines over the last three years, but that it is Pawtucket that is left with wear and tear on the roads used for detours and with negative impacts on businesses along the detours. The bridge is between Exits 27 and 28 on Route 95. One thing I have noticed since the recent improvements is that more and more trucks are using the local bypasses. My assumption is not that these are just more local deliveries, it is that they have made it an easy enough detour that trucks are no longer using 146 or 295 to bypass this bridge. I assume the price of diesel isn’t helping. This project has actually been a lot more disruptive than I imagined, and I have a pretty cynical imagination. They do seem to be making decent progress though.